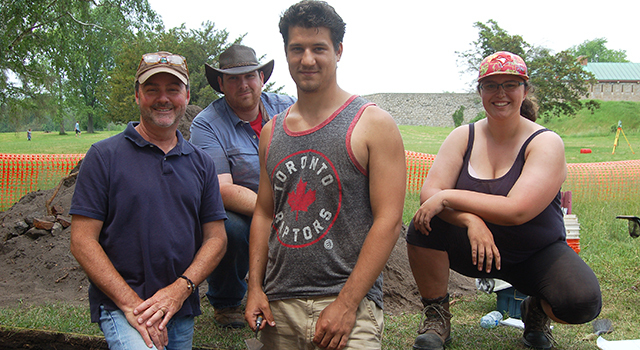 Twenty-one Wilfrid Laurier University archaeology students spent part of the summer digging into the past at Old Fort Erie, helping shed new light on a pivotal period in North American history. "The fort you see at Old Fort Erie National Historic Site today is called 'Old Fort Erie,' but it's really the 'new' fort, built in 1805," says John Triggs, associate professor and chair of Archaeology and Heritage Studies at Laurier. "There was a fort there before that, which was built in 1764 and demolished when the new fort was built. That older fort is the fort students are excavating and researching, the earliest British fort and community in southern Ontario." 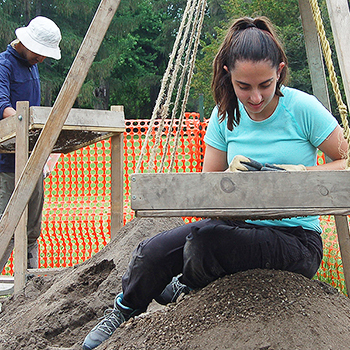 The dig is part of a six-week, mandatory for-credit field course led by Triggs that teaches students the skills used in modern archaeological investigations. Those skills include archaeological surveying, excavation and how to properly record finds. "These kinds of opportunities for students are few and far between when it comes to studying archaeology in Canada," says Triggs. "Laurier is the only school that makes field work mandatory for the program and we've been doing that since 1974." This year marked the fourth season of excavation at Old Fort Erie, with a dig planned to take place every second summer. During four seasons of work since 2012, Triggs and his students have unearthed more than 100,000 artifacts, with more than 75,000 discovered in 2015 alone, including musket balls, flints and other military paraphernalia. While some of the finds may seem unremarkable - small pieces of ceramic tableware, buttons, pins or a padlock, for example - they are helping paint a clearer picture of what life was like for the inhabitants of the original Fort Erie. Triggs and his students have also discovered Indigenous artifacts, illustrating the fact that First Nations peoples were present at the site of Old Fort Erie for thousands of years before the arrival of Europeans. Strategically located at the head of the Niagara River, Old Fort Erie was a gateway to newly held British territory that served political, economic and military purposes following the French-Indian War. The original fort and immediate surrounding area was home to fewer than 100 people, mostly members of the military and merchants, some with their families. "As a frontier fort, Fort Erie was meant to be a bastion guarding the entrance to the Niagara River," says Triggs. "Anybody who came through this area had to go by the fort. It also served as a fur trade post with First Nations peoples coming here to trade." Triggs discovered the location of the original Fort Erie, as well as the buildings that surrounded it, in 2013. A short walk from the modern-day Old Fort Erie National Historic Site, the original fort was located on the shore of Lake Ontario. Over four summers, Triggs has led students in the excavation of five structures that were located just outside of the original fort, including a blacksmith's shop and officers' quarters. While long demolished and buried, the structures can be seen on historic maps and watercolour paintings. "Artifacts tell you about what life was like for these people who were living here on the frontier," says Triggs. "I look at artifacts as showing the ways they adapted to their new environment. We're getting new information, primary information, that is a part of the fort's history. Everything we find is something that adds to the story." In addition to learning how to use tools of the archaeological trade, students taking part in the Old Fort Erie dig also receive training in how to conduct "public archaeology," something Triggs says will be crucial in their future careers. "Public archaeology is just as important as learning technique," he says. "It is about getting the word out to the public, which is an important part of modern archaeology." There has been great interest from the public about the Old Fort Erie dig, which has been featured in print media, on television, by podcasters and during public lectures attended by more than 100 community members. Local residents and tourists passing by the site will often stop to watch students at work and ask questions. The students say they are happy to be playing a role in contributing to a better understanding of the history of Old Fort Erie. Laurier student Antiy-Demian Savov describes his six weeks working on the project as "an amazing hands-on experience." "It's very pleasing to find something that no one has seen in a very long time," Savov says. "There's an adrenaline rush that comes with that." Triggs initiated the Old Fort Erie dig in 2012 as a way to mark the bicentennial of the War of 1812. There had never been research archaeology conducted at Old Fort Erie, so he approached the Niagara Parks Commission, which operates the fort, in the hope of forming a partnership. "The parks commission is very pleased because this kind of archaeology isn't done in the province very much anymore," says Triggs. "Most of the archaeology being done today is professional archaeology, mitigating sites before something is built on them. This project is research archaeology and the fort is thrilled to have us here." During their time in Niagara Region, students stay in the historic Bertie Hall, a mansion constructed in 1833 that is today owned by the Niagara Parks Commission and provided for student use as part of the commission's partnership with Laurier. Jim Hill, superintendent of heritage with the Niagara Parks Commission, says Triggs and his students are undertaking valuable work that adds to the knowledge base about Old Fort Erie, including concrete evidence of the locations of the fort's original buildings. "This wouldn't be taking place without the hard work of professor Triggs, his staff and his students," says Hill. "And it's being done solely for the purpose of gaining knowledge. Their work has garnered a lot of interest in the community and all of it in a positive light." 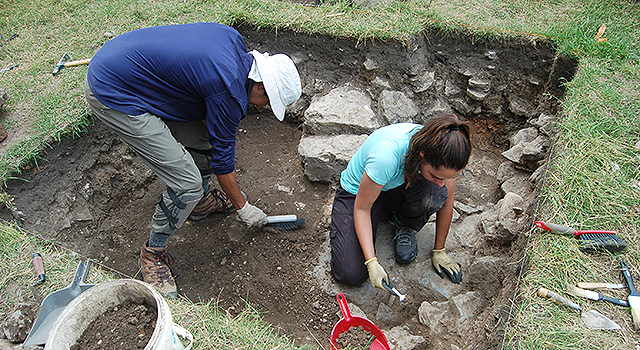 Old Fort Erie is not the only dig location where Laurier's Archaeology and Heritage Studies students are gaining hands-on experiences in their chosen field. Each year, the department runs domestic and overseas digs. Other locations include a Huron-Wendat site near Midland, Ontario, that dates to the early 1600s, as well as field schools in Jordan and Greece. All of the digs are held soon after the end of the academic year, allowing students to secure summer jobs when they return. "You can definitely make a living in the profession of archaeology," says Triggs. "There are about 100 consulting companies in the province and these students at Old Fort Erie have been offered employment by two different companies this summer after they finish the program." Student Sean Horricks says learning practical skills by participating in the Fort Erie dig has deepened his desire to pursue archaeology as a career. "You're learning how to do archaeology," says Horricks. "When you sit in a classroom, you learn about the theory but you don't get that hands-on experience. So this is really cool." Watch students at work and John Triggs discussing Laurier's archaeological dig at Old Fort Erie in a Niagara Parks Commission video.